Taiwanese movie Secret, a recent addition to Netflix Instant, is indeed full of secrets. Characters keep them from one another, sometimes intentionally, sometimes not. None are meant to be harmful, and many are for the sake of playful flirtation. Lun* is a gifted high school pianist who transfers to a new art school. When he first meets Yu, she’s playing a beautiful, mysterious song. She won’t tell him what it’s called, saying it’s a secret. Thus their flirtation begins, though it takes a while to flourish because Yu is often absent from class, saying that she’s busy practicing. Lun quickly becomes popular at the school, befriending girls and rugby thugs alike. His popularity reaches a height when he beats the school’s top performer in a piano battle, all so he can win a rare sheet of music as a gift for Yu. He can’t give it to her right away because she’s once again absent, and when he finally meets her again, she’s sick. She claims it’s just asthma, but it only deepens the mystery around her. Viewers might guess where this is going. They’re not entirely wrong, but they’re not entirely right, either. For its first half, Secret is a sweet teenage love story set to a beautiful piano score, made up mostly of Chopin the “piano poet,” and of original songs composed by lead actor Jay Chou. A somewhat somber or mysterious tone present from the beginning hints at a tragic secret, but when its details start to be revealed, it’s something unexpected. Secret was directed, written, and the music composed by Jay Chou, who also stars as Lun. American audiences might know him best for playing Kato in the cinematic remake of Green Hornet, or perhaps for martial arts/action films Curse of the Golden Flower or Kung Fu Dunk. Despite that, in his native Taiwan Chou is most famous as a musician. That’s his primary career; he just acts on the side, and it shows. As Lun Chou is a cutie, but a bit uninteresting. He especially doesn’t sell his character’s romance that well. Lead actress Lunmei Kwai did much better as Yu. Yu and Lun’s playful, flirtatious, teasing relationship really was enjoyable to watch, and most of that is down to Kwai’s performance. But although their relationship is really cute on screen, it’s more or less forgettable when it’s off. It’s hard to become that invested in their love story, which leads to problems later in the film. We’re supposed to buy that the characters would make great sacrifices to be together, but we don’t care enough about their relationship to accept just how far they’re willing to go. They haven’t spent all that much time together, and while they’re cute enough, they’re not selling a grand love. This is further hampered by the relationship between Lun and his father. Anthony Wong’s performance as Chiu, Lun’s father and a teacher at his school, is the strongest in the film. Theirs is an adorable father-son relationship of good-humored affection and teenage exasperation. A standout scene is when Chiu insists that, in exchange for something Lun wants, he has to waltz around the living room with his father. At the end of the film, when we’re supposed to be the most invested in and caring about seeing Lun and Yu together, it’s hard not to be more concerned with how Chiu will react to Lun’s drastic actions. For all that he’s outdistanced in acting by his costars, however, Chou brings a lot to the film. The two halves ought to feel disparate but they don’t, and that’s a credit to both Chou’s directing and his writing. 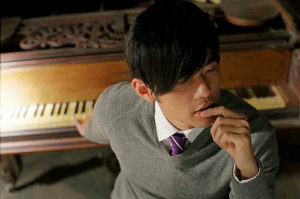 The film’s best parts are also the performance scenes, and by all indications Chou plays all of the pieces himself. That’s especially impressive when one considers the piano duel scene; perhaps Chou wouldn’t write a scene he couldn’t perform himself, but it’s still the best scene in the film and an extraordinary performance. It’s clear that Chou’s greatest strengths lie with music, and so it was wise of him to create a film that relies so much on his talents in that area. How much you’re going to enjoy Secret depends on how much you enjoy music-driven love stories. I’m a sucker for them, and so the film drew me in despite the fact that I wasn’t buying any lasting devotion between Lun and Yu. Besides, not every love story on screen has to be an epic story (even if the end of Secret itself kind of wants us to think that). I love that Yu is the more flirtatious, playful one in the relationship, always teasing Lun. Their sweet, simple romance gives an innocent tone to the first half of the movie. The surprise twist of the second keeps the viewers engaged, even if it requires them to believe more in Yu and Lun’s relationship than it warrants. Secret is a unique film, and despite the fact that it’s also clearly a showcase for Jay Chou’s talents, (perhaps because it’s a worthy showcase), it feels less like a vanity piece than it should. It’s a must watch for any classical music fans, and still a sweet little film for anyone to enjoy. *Note: Netflix’s subtitles give Westernized names for the characters. For the purposes of this review I’ve used the names in Netflix’s summary of the film, which are abbreviated versions of the full Chinese names given for the characters. You can find Secret streaming or on DVD at Netflix and Amazon.